OVERALL: A fun romp of a movie that didn’t do what one would expect of the plot. 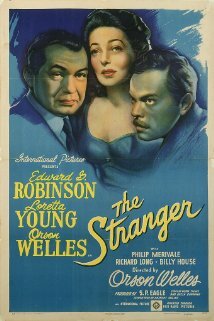 Plus watching Orson Welles skillfully manipulate Loretta Young was great. POINTS: Orson Welles directed this and that made it fun. Also watching a movie from 1946 talk about Nazis, a subject very fresh on everyone’s mind, I would think – was interesting. PITFALLS: I think that styles of acting change over time. So this movie being set in the 1940s means, by my 21st millennium movie viewing eyes, everything is too overly dramatic. The music is obvious in manipulating your emotions, Orson Welles doesn’t seem to blink, and Loretta Young is overwrought almost all of the time. CULTURAL PITFALL(S): Oh good grief do the college guys really have to whistle and objectify the woman walking past them? *raspberry* Plus the women are treated like delicate, overly emotional children. Welcome to 1946 and thank goodness I don’t live there. HIGH POINT(S): [SPOILER ALERT] Our heroine finally grows a pair of ovaries and seriously confronts our villain in a totally verbal badass way. Go Mary! BECHDEL TEST (Website): Not rated by surprisingly I think it passes. There are two named female characters who have a conversation and it isn’t about a man. Huh. DVD/BLU-RAY WORTHY: Hmmm… well sure. I wouldn’t run out to buy it, but if I saw it on sale I would pick it up.